Blog > DUCATI MONSTER DIESEL - TWO ICONIC BRANDS, ONE BRAVE PASSION! DUCATI MONSTER DIESEL - TWO ICONIC BRANDS, ONE BRAVE PASSION! Wait a second... a diesel Ducati? Has the sale to Audi gone through and the TDI engine made its way onto two wheels already? In a word: no. This isn't diesel with a small D, but Diesel with a capital D – as in the Italian house of denim. Diesel signed on last year as a sponsor of the Ducati racing team in the MotoGP series, and has now taken the partnership to a new level by giving the Monster 1100EVO the same kind of treatment it's applied to the Fiat 500. That means a military theme with Diesel's trademark matte green paint, yellow brake calipers and rear spring, and blacked-out frame, engine covers, exhaust and forks. The special edition model is, of course, being launched with a range of biker gear including everything from jacket to jeans, all in typical Diesel style but with an added dose of burnt rubber. Follow the jump for the full press blast and check out the trio of images in the gallery for a closer look. New York, USA, 15 March 2012 - Introducing an exciting new phase in the partnership, which started in 2011 with the sponsorship of the Ducati Team in MotoGP, Ducati and Diesel now launch the Monster Diesel with a dedicated Capsule Collection. The brand new customised model is an 'urban military chic' interpretation of Ducati's iconic naked motorcycle and will be unveiled alongside the new collection at the Diesel stores of New York-Soho (15 March) Rome (22 March) and Tokyo-Shibuya (29 March). "The Monster Diesel, and the collection dedicated to it, reflect the "coolness" of this iconic motorcycle and our brand in general," said Gabriele Del Torchio, President of Ducati Motor Holding. "The collaboration with Diesel, underlines our focus on the style and trends that shape the market and I am delighted to associate our world with that of fashion and, in particular, with Diesel. Both brands globally represent technology and innovation in pure Italian style." Stefano Rosso, Project Leader and son of Diesel founder, added: "When we had the opportunity to work with Ducati, with last year's MotoGP sponsorship, we discovered a whole world of shared values and common roots. That brought us the desire to create something new together, and we made it in the only way we know: taking the great know-how of both companies and mixing it with passion and creativity. The results are unique products, characterised by a great mix of design and technology." The collaboration is celebrated with a Capsule Collection reflecting the brands' DNA and common roots of creativity and innovation, the key elements that enabled the two companies to become renowned icons of the "Made in Italy" tradition. With Ducati's flagship Monster 1100EVO providing the canvas for the new motorcycle creation, Diesel's founder Renzo Rosso and the Ducati Design Centre guided stylists to a military inspired theme, expressing the core values of the partnership and realising an avant garde choice for connoisseurs of lifestyle motorcycling. 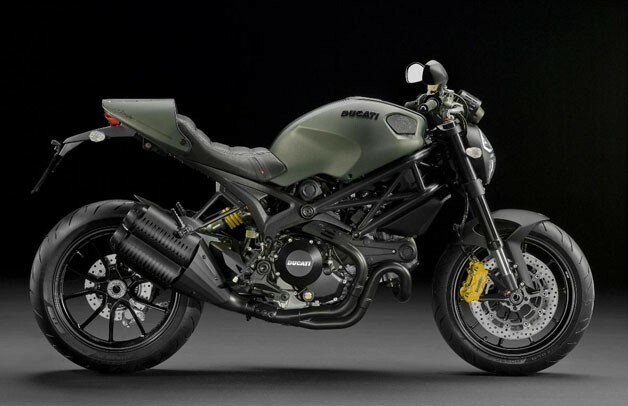 Set against the black treatment of Ducati's Trellis frame, wheels, engine covers, exhaust system and forks, the exclusive 'Diesel Brave Green matte' livery delivers a rugged military vehicle feel, while front brake callipers are finished in shocking yellow to make a strong reminder of the model's performance heritage. All pieces are characterised by pure biker attitude, clean technical details and bold Diesel graphics, such as the treated rubber prints recalling the burnt rubber of the motorcycle's tyres. Colours for the collection are black, grey, white with pop up red inspired by logos from both brands, while the range of fabrics goes from treated nylon and cotton to denim and overdyed jersey mix with leather and metal applications. Inspired by the technical wear and perfectly combining design with a strong biker style, the new collection is identified by a brave and irreverent touch, and will be available starting from mid-April in the Diesel Stores, the Diesel online store and a selection of the best Ducati dealers. The Monster Diesel will be available at Ducati stores around the world from late July onwards. More information is available at Ducati.com from where the desire to own can be relayed direct to local dealers. Founded in 1926, Ducati has been producing sport-inspired motorcycles since 1946. Their motorcycles are characterised by "Desmodromic" performance engines, innovative design and avant-garde technology. Covering several market segments, Ducati's range of motorcycles are divided into model families which include: Diavel, Hypermotard, Monster, Multistrada, Streetfighter and Superbike. These authentic icons of "made in Italy" are sold in over 80 countries around the world, with concentration on the European, North-American and Asia Pacific markets. Ducati competes in both the World Superbike Championship and, with an official team, the World MotoGP Championship. In Superbike Ducati has won 17 Manufacturers' titles and 14 Riders' titles and in 2011 passed the historic milestone of 300 race victories. Ducati have participated in MotoGP since 2003, and took both the Manufacturers' and Riders' titles in 2007. Diesel is a global lifestyle brand. From its headquarters in Breganze, it directly manages 19 subsidiaries across Europe, Asia and the Americas. It is now present in more than 80 countries with 5,000 points of sale and more than 500 Diesel mono-brand stores. Diesel is part of the holding Only the Brave, which also incorporates 55DSL, Maison Martin Margiela, Viktor & Rolf, and Staff International. In 2010, the holding's revenues amounted to 1.3 billion euro.